Teach English in France! Are you ready to expand your cultural horizons and share your language and culture with French students? The Teaching Assistant Program in France offers you the opportunity to work in France for 7 months, teaching English to French students of all ages. Each year, nearly 1,500 American citizens and permanent residents teach in public schools across all regions of metropolitan France and in the overseas departments of French Guiana, Guadeloupe, Martinique and Réunion. The program’s goal is to strengthen English-language instruction in the French educational system through the establishment of a native speaker presence. The program also provides future teachers of French in the United States with excellent teaching experience and first-hand knowledge of French language and culture. Assistants are assigned a 12-hour per week teaching schedule that may be divided among up to three schools. Classes are conducted in English. 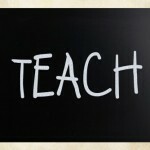 The teaching assistant may conduct all or part of a class, typically leading conversations in English. Duties may include serving as a resource person in conversation groups, providing small group tutorials, and giving talks related to American studies in English classes. Assignments vary depending on the school’s needs, the assistant’s abilities, and the educational level to which he or she is assigned.